Emile Bustani Seminar: “Why the Palestinian, Zionist, and Algerian National Movements Competed, Fought, and (Mostly) Won"
Many of the world’s states—from Algeria to Israel to the United States—are the result of robust national movements that achieved independence. Many other national movements have failed in their attempts to achieve statehood, including the Kurds and the Palestinians. How does one explain these successes and failures? Focusing on the internal balance of power among nationalist groups (who cooperate with each other to establish a new state while simultaneously competing to lead it) and the use of violent and nonviolent strategies provides a new understanding of national movements and the causes and consequences of contentious collective action today, from the Arab Spring to the civil wars and insurgencies in Syria, Afghanistan, Iraq, and beyond. 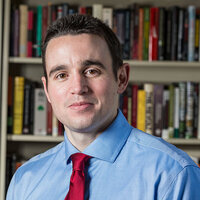 Peter J. Krause is Assistant Professor of Political Science at Boston College and a Research Affiliate with the MIT Security Studies Program. His new book, Rebel Power: Why National Movements Compete, Fight, and Win, is available from Cornell University Press. His research and teaching focuses on Middle East politics, terrorism and political violence, national movements, and international relation. He has a Ph.D. in political science from MIT and a B.A. in political science and history from Williams College.